A new set of grand ducal standards were adopted 17th December 1891, according to Ströhl 1897 [stl97]. i.e. "new standards for the members of the grand ducal house were introduced on 17th December 1891, published in the State Gazette for the Grand Duchy of Baden, no. 39, 30th December 1891". Ströhl 1897 [stl97] shows this standard with a yellow field but the Baden escutcheon in it has a (metallic) golden field. The escutcheon is surrounded by the collar of the Hausorden der Treue, the Order of Loyalty of Baden's grand ducal house. The Order of Loyalty was founded by Margrave Charles II of Baden-Durlach on 17th June 1715 and was the highest Order of the Grand Duchy since its establishment in 1806. This flag appears in Neubecker 1933 [neu33], p. 46, ill. 155, as Standarte der verwitwete Grossherzogin Luise, geb. [oren] Prinzessin von Preussen i.e. Standard of Widow Grand Duchess Luise, born Princess of Prussia. I guess the reason is that she was actually the Grand Duchess at the time Ströhl 1897 [stl97] was published, becoming a widow at some point between 1897 and 1918. There are a couple of mistakes in the above image. The sinister escutcheon (ie. the shield on the right) should be the arms of Prussia, as they appear for example on the centre of the Prussian royal standard. Also the decoration hanging from both escutcheons appears to be a blue (not gold) cross pattée on Neubecker 1933 [neu33]. According to this webpage, Friedrich II was the son of Grand Duke Friedrich I (1826-1907) and Luise Marie Elisabeth of Prussia (1838-1923). I guess the latter used this standard during the reign of his husband and also after his death, hence the caption Standard of Widow Grand Duchess Luise, born Princess of Prussia in Neubecker 1933 [neu33]. Ströhl 1897 [stl97], plate XIX, number XV, shows the standard of S[eine]r Königlichen Hoheit des Grossherzogs von Baden [His Royal Highness the Grand Duke of Baden]. That was in 1897 Frederick I (born 1826, reigned 1852-1907). He was married to the Prussian princess Luise (1836-1923, daughter of King William I, from 1871 German Emperor). Her standard appears in Ströhl 1897, plate XIX, number XVI. The decoration is the Luise cross, an order for women in honour of famous Queen Luise of Prussia, her grandmother after whom she was named). Ströhl 1897 [stl97] shows this standard with a yellow field but the Baden escutcheon in it has a (metallic) golden field. Ströhl 1897 [stl97] points out two peculiarities on the standard of the Grand Duchess Louise princess of Prussia, daughter of Emperor William I. Firstly the Hohenzollern banner-of-arms depicted on the canton is mirrored: quarterly black and white (instead of quarterly white and black). Secondly, in the arms of alliance of Baden and Prussia, the escutcheon of Baden is not mirrored en courtoisie but depicted as usually. Here I would hypothesise that so as not to show a 'bend sinister Gules' for Baden which might be mistakenly interpreted as a mark of bastardy. This flag appears in Neubecker 1933 [neu33], p. 46, ill. 154, as Standarte der Grossherzogin Hilda i.e. 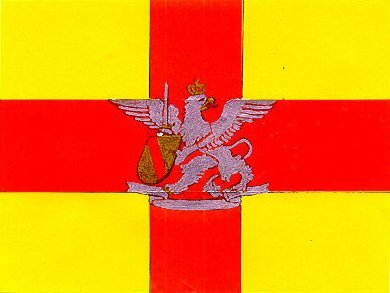 Standard of Grand Duchess Hilda. (...) This webpage about Friedrich II, last Grand Duke of Baden who abdicated 1918 says he was married to Hilda Charlotte Wilhelmine of Nassau (b. 1864). Frederick, son of Frederick I and Luise of Prussia succeeded in 1907 as Frederick II, abdicated in 1918 and died in 1928. The succession passed to his cousin Maximillian and his son and grandson. Frederick II was married to Hilda of Luxemburg (1864-1954, daughter of Grand Duke Adolf). Ströhl 1897 [stl97], p. 81, says they both used the standard with the griffin, illustrated as number XVII (scan here). It seems that after her husband's accession, Grand Duchess Hilda kept on using the standard with the griffin while her husband of course took over the grand ducal standard. They had no children. Prince Max was the heir to the throne. Ströhl 1897 [stl97] shows this standard with a yellow field but the Baden escutcheon in it has a (metallic) golden field. Moreover it shows a silver griffin, standing on a white scroll shaded in grey. Ströhl 1897 [stl97] explains however that the armorial design matches that shown in the guidons of the Baden cavalry. I guess Heir Grand Duke Frederick (who later reigned 1907-1918 as Frederick II) had some special relationship with the Baden cavalry but I have no further knowledge on the subject. Ströhl 1897 [stl97], plate XIX, number XVIII, shows the standard used by other princes and princesses of Baden [yellow-red-yellow with the crowned lesser arms]. Ströhl 1897 [stl97] shows this standard with a yellow field but the Baden escutcheon in it has a (metallic) golden field.